If the man in your life has been yearning for a space to call his own, you might want to think about designing a "man cave" – but what exactly is this commonly talked about "cave?" It can be simply defined as an area where a man (or anyone in your household) can retreat to enjoy some favorite hobbies, whether it's watching football or making model airplanes. However, the best man caves have items from Designer Appliances that cater to making the space relaxing. If you're interested in giving him a place where he can cheer for his team with his friends or an area he can cat nap, here are some tips for creating a space that the special man in your life can enjoy for years to come. If you have the space in your man cave, it's worth installing a compact refrigerator to store everything from beer to leftover sandwiches. He won't have to go up and down stairs to find everything he needs when he's relaxing in the space. One refrigerator you may want to consider for your man cave is the Marvel 30iMTWWOLP. This model is compact enough to fit into any small corner of a man cave, and it has adjustable shelves for the utmost convenience. It also has a manual defrost freezer and an interior light. What better place to watch a sporting event than your own home theater? If the man in your life has a love of football or he simply enjoys watching high definition movies, Woman's Day magazine recommended creating a man cave to suit his needs. This means creating a theater-like atmosphere with the appropriate appliances and equipment to develop the full experience. Before you begin shopping for a television and sound system, make sure to measure your prospective man cave beforehand. This will let you know how much space you have to work with prior to purchasing items for the room. You might love that big screen TV on sale, but it doesn't do much good if you can't fit it into the space! Your man cave would be incomplete if you didn't have something that could serve delectable beverages. For this reason it's a good idea to invest in a kegerator for your space. An item such as the Marvel 24" Outdoor Half Keg Refrigerator can help you serve frosty beer whenever you have a thirst that needs to be quenched. This keg refrigerator also has full auto defrost and an adjustable temperature. If you and the man in your life are big entertainers, this product will also come in handy. And try out the Kegarator – single tap TUR24BDRSSA as well. A kegerator can make serving drinks easier when you have several people around. Perhaps your man has refined tastes and likes to relax with a glass of wine. If this is the case, you can benefit from having a wine cooler in your man cave. For example, the TRUE TWC 24DZRSGA (dual zone) can keep all of your delectable wines chilled and ready to serve when it comes time to indulge. If you love to entertain friends or just the people in your household, a wet bar can make it easier to do so. Start with a spacious. Franke Bar sink KBX-110-8. The Summit BI540LCSS is a must for any wet bar space, and either the Marvel 30WCMBSGL or Viking VWCI1240GLSS are must-haves for the wine connoisseur. More of a beer drinker? The Perlick HP24TS1R2 and Summit SBC4907TWIN are ideal for your wet bar. And you'll also want a Scotsman Ice Maker DCE33A1BC. It's perfect for mixed drinks or tall, frosty glasses of water. Don't forget about adding lighted cabinetry to showcase all of your wine, beer and other beverages. In order for your man cave to come together seamlessly, you're going to want to bring in a professional to do the hard wiring and plumbing. This is especially necessary if you're going to be introducing a television, sound system and other electronics that need to be handled with care. While it might cost money to bring in an expert, you'll be thankful that you did when everything is functioning properly. DIY Network stated that selecting a focal piece for the entire room can help you create a more cohesive interior design. 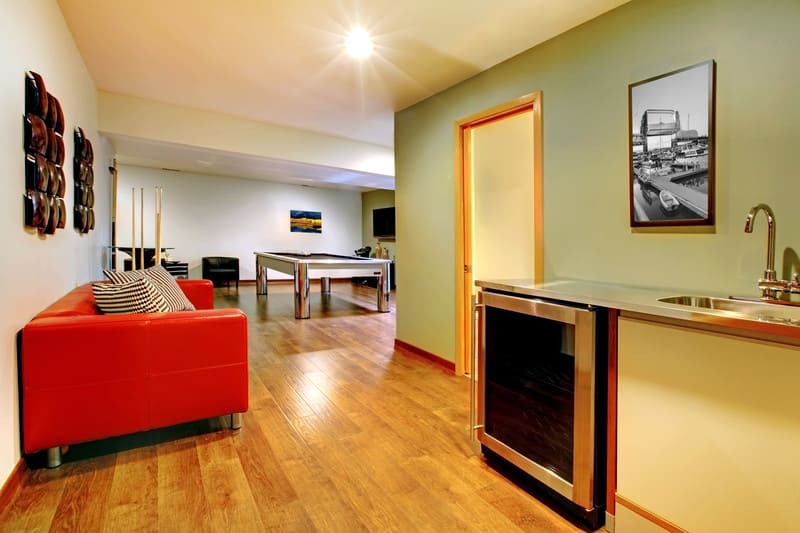 For instance, think about bringing in a pool table or a comfortable futon that everyone can enjoy. You can also use the colors and designs of your focal piece to inspire the rest of your decor. Whether you're interested in creating a man cave for football season or year-round use, these tips can help you achieve your interior design goals.